A Tamworth cyclist has undertaken some of cycling’s toughest challenges to help the hospice which cared for his dad. Steve Godwin, who is Workshop Manager at 2 Wheels Only in Tamworth, tackled all three routes of Cycle St Giles Whittington cycling 140 miles in one day. Starting at 4am Steve cycled the 25 miles, followed by the 40 mile route arriving back at the hospice for 9am to start the 75 mile ride with all the other participants. He followed that with an amazing 23.5 hour cycle ride up and down Boot Hill in Grendon, climbing the equivalent of Everest (more than 29,900ft) by cycling up the hill an amazing 127 times. Steve has already raised more than £1,500 for St Giles to say thank you for the support given to his dad Maurice, who died just a few days after Steve completed his Everest challenge. “We contacted St Giles for support for Dad, who had cancer which spread to his bones, and the community team were amazing,” he said. “It was such a relief to have their help and we are overwhelming grateful for everything St Giles did for Dad. Steve is now planning his final challenge known as ‘The Limit’ climbing 10,000 metres (more than 6 miles) in a single ride without sleeping, to gain entry in to the High Rouleur’s Hells 500 club. “The Everest challenge was really tough and there were some really dark moments at 4am but the fantastic support I received and knowing why I was doing it spurred me on,” said Steve. “I think the last one will be even tougher and it’s going to take some careful planning and some very big hills to meet the target. St Giles Senior Events Fundraiser Zoe Westwood said Steve had already completed two amazing challenges. 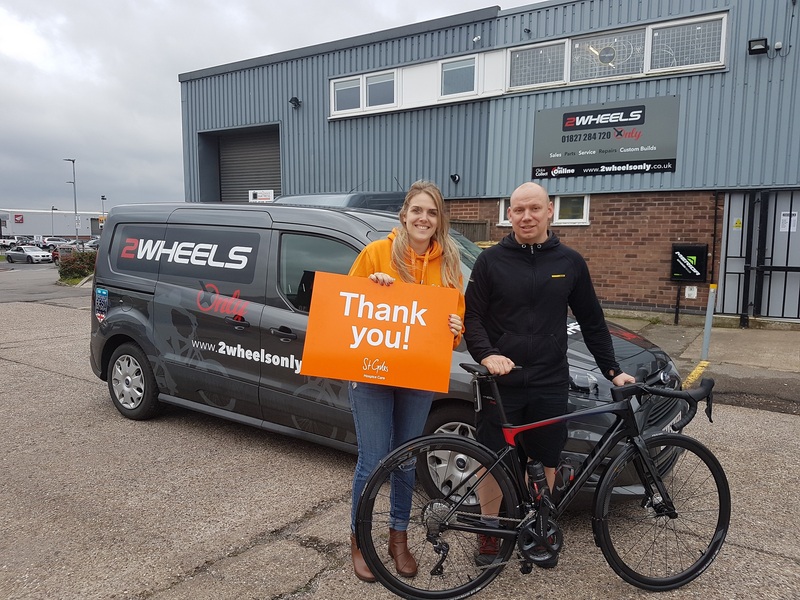 “What Steve has achieved so far is brilliant and we’d like to thank him for his amazing fundraising as well as all the help he and the 2 Wheels team have provided for the cycle ride,” she said.